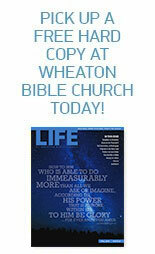 How long have you been a member of Wheaton Bible Church? Tell us why and how? My wife, Susan, and I have attended for 19 years and have been members for 15 years. After moving to Wheaton, we were invited by Susan’s aerobics instructor to visit the church and Providence Adult Community. We had visited a couple times almost a year before, but the connections we made with the people in Providence sealed the deal, and we’ve been here ever since. Describe a memorable church experience. Some that immediately come to mind: working in the nursery during the Sunday evening services we used to have, serving every year with Dr. Paul Jordan to set up the Great Family Fun Fair, taking GO Team trips (Chicago, Dominican Republic, Morocco, and France), and delivering Christmas gifts to children of detainees in Cook County. There are so many more! Give me a call or let me buy you a coffee, and I’ll talk your arm off! For four and a half years. I’m a fixer and a control freak by nature. Things that are obviously not in my power to fix continually drive me to my knees before the Lord. So I find myself most challenged and rewarded as an Elder where God meets me the most: where I cannot succeed unless He shows up. Most of the time that place of challenge and reward involves helping people who are hurting and struggling. What do you tell someone who is facing death? How do you help a person who has years or even decades of bad decisions? What do you say to a faithful spouse who’s been betrayed or to a spouse who’s been unfaithful? I was in the third grade. I became very concerned about where I would spend eternity. My parents read John 3:16 to me and explained that I could have eternal life by accepting God’s gift of Jesus and His death for my sin. So, I did just that. What is your favorite Scripture verse? Why? Tell us about growing up. I am the oldest of four kids, with one younger sister and two younger brothers. In addition, my parents took in a 14-year-old foster kid named Bob for a couple of years when I was in early elementary school. My parents strived to model authentic Christ-following lives and pointed the four of us children to Jesus. We moved a lot, and the most I attended any one school was three years until I went to Wabash College. Dad was a teacher and coach, and later, a high school principal. That mostly was in Indiana until the last 15 years of his career, when he worked overseas as a headmaster of an international school in Japan and a superintendent of an oil company’s school in Venezuela. Dad’s love of sports, his coaching, and involvement with the schools we attended meant we virtually lived at school, in the gym, or on the practice fields—practicing, playing, or working out. We also spent significant time at my grandmother’s lake cabin water-skiing, cutting wood, and being on the water. During my second- and third-grade years, from 1970 to 1972, Dad and Mom took us to the Dominican Republic. We lived in Santo Domingo the first year and Bonao the second year. Susan and I have been married for 26 years. We have two beautiful daughters: Catherine, who’s nineteen and a sophomore at Cedarville College in Ohio, and Sarah, a seventeen-year-old junior at Wheaton Academy. We really enjoy being together as a family at home, sailing, skiing (water or snow), and traveling. Tell us a story about your upbringing or life that offers insight about you or your walk with God. I flew the A-6E Intruder for the Marine Corps and was on track to have a very successful career as a Marine officer. In October 1990, before the first Gulf War, during an air support mission 12 miles south of Kuwait, I hit an uncharted, unlit, and abandoned 320-foot-tall radio tower while going about 500 mph. The impact cut off about twelve feet of the right wing and one of the tower’s support wires shaved off six feet of the right engine intake. I was extremely fortunate to survive the initial accident, regain control of the jet, and fly it back and land at our base in Bahrain. For numerous ill-conceived reasons, I chose to lie about my altitude during the investigation of the incident. At the end of the day, the lie became the issue that caused the Marine Corps to take away my flight status and ask me to select another job in the Marines. Instead, I choose to become a civilian and got a job with American Airlines (AA). Although my career at AA certainly has not been anything close to what AA promised it would be, God has been faithful, and He has provided for me and our family all along. Truly, we have been blessed. If you could speak with each member of the congregation, what would you say? I would point them to Jeremiah 29:11: “‘For I know the plans I have for you,’ declares the lord, ‘plans to prosper you and not to harm you, plans to give you hope and a future.’” Jeremiah wrote this to a nation in exile. Their homes had been burned to the ground, and everyone they knew—friends and loved ones—had been brutalized and killed or carted off to a foreign land to live for the rest of their lives and generations after them in poverty and slavery. Still, God, through Jeremiah, promises hope and prosperity in their future. If people in these circumstances could have hope, how much more can we? My friends, it is all about relationship. God created you to know and be known by Him, to walk with Him every second of every day for eternity, and to be filled to overflowing with His love and grace so that we can all, like Jesus and through the power of the Holy Spirit, live lives that touch and change other people’s lives for eternity and to God’s glory. At the end of the day, at the end of our lives, it’s our relationships that matter, not our things, activities, or even our careers. My prayer for our congregation is that we would grasp the fact that all God wants from us is our hearts. This entry was posted on December 1, 2012 by Wheaton Bible Church in Elder Profile, Winter 2012/2013 and tagged elder profile, scott mcclain.